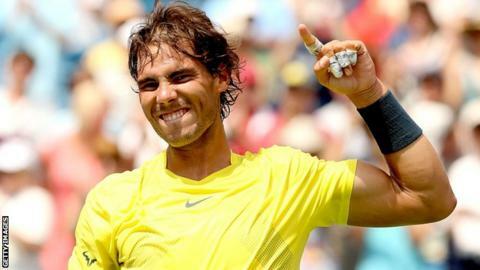 Rafael Nadal's scintillating form has made him the man to beat at the US Open, according to Novak Djokovic. The Spaniard has a 15-0 record on hard courts in 2013, having won Masters titles on the surface in Indian Wells, Montreal and Cincinnati. His success is all the more remarkable as he only returned from a seven-month injury lay-off in February. "Nadal is definitely back and playing maybe the best tennis that he ever has played on hard courts," said Djokovic. The world number one added: "He's definitely so far the best player this year. There is no question about it. The results are showing everything." Defending champion Andy Murray admitted Nadal will be "very difficult to beat" in New York. Murray, who expects to play his opening match against Michael Llodra on Wednesday, has been hugely impressed by the 12-time Grand Slam champion's form. "It's hard not to be," said the 26-year-old Scot. The win in Cincinnati was his ninth title of the year and fifth Masters 1000 victory. He joined Novak Djokovic as the only players to win five Masters 1000 crowns in a single year. It was his 26th career Masters title - he leads the all-time list ahead of Roger Federer (21). Nadal has won 53 of 56 matches in 2013, including nine titles. He has reached the final in 11 of the 12 tournaments he has played in 2013. "He hasn't lost yet because he's beaten some tough players in tough tournaments, winning the two tournaments back to back in Cincinnati and Canada. I think it's only been done once before. "I think Roddick did it once [in 2003], so it doesn't happen often. It's not like he's had easy draws or whatever. He's beaten some top, top players." Roger Federer, a five-time champion at Flushing Meadows, was in agreement, having lost to Nadal in the Cincinnati quarter-finals. "I'm clearly very impressed," said the Swiss, who plays Grega Zemlja in Monday's night session. "Especially seeing him play really well on the quicker hard courts. "It would be different if it was just Indian Wells and Miami where it's very slow over there, and then Montreal and Cincinnati would have been first round [losses]. "But he won those as well, and he showed also on the quicker hard courts he's someone to be reckoned with." Djokovic, the 2011 US Open champion, was beaten by Nadal in the Montreal semi-finals and said the Spaniard's knee issues have affected his style of play. "He won three Masters events," said Djokovic, who is in the opposite half of the draw to Nadal in New York. "He won it in great style. He was very aggressive, and he seems like he changed a little bit the game. "He stepped in a little bit more. He knows that now he has to be a bit more aggressive than he usually is because of, I guess, his knees and everything and because hard court is not clay. It's not his favourite surface; it's faster. "I'm sure he worked on that, and you could see that all the work he put in is getting results." Nadal, the 2010 champion in New York, agreed he had been more attacking in his outlook on hard courts since returning to the tour. "I think you can play aggressive when you are playing well," he said. "That's the first and important thing. It's true I'm trying to take the ball a little bit early, that I worked on my game to be a little bit more aggressive. "But at the same time, it's true that in the past when I was playing well on this surface I had good success too. "So it's not something crazy that changed today, that I had the chance to play well on hard." Second seed Nadal begins his bid for a second US Open title against American Ryan Harrison on Monday.